Leading Indicators – Big MISS, But New Orders are HOT! 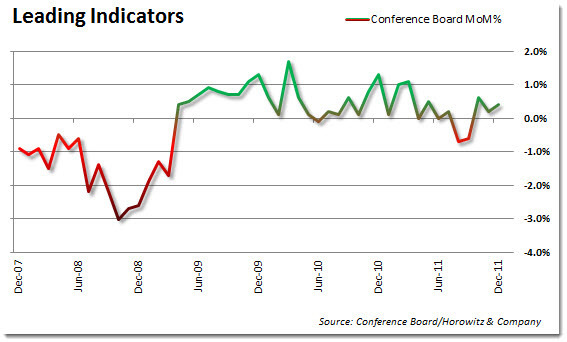 The Conference Board released the Leading Indicators for the latest period. On the whole, it was a disappointment. Expectations were for a +0.7% and the actual number came in at +0.4% and the previous month was revised lower (SURPRISE!) from +0.5% to +0.2%. It has always been odd that this index could have such a wide miss as most of the components are know in advance. This will be the last time for a while that we will be using this and providing information as the Conference Board is changing the makeup of the indicator. Until we can look as the new components and the historical reference as it related to this index, it does not make a whole lot of sense to even consider it. Here is a look at the current components and how they added/subtracted to the index this period.